Lucie is a PhD student at the School of Electronics and Computer Science, University of Southampton, as part of the Web and Internet Research Group. She is a research associate at the TIB Scientific Data Management Research Group in Hanover and was part of the part of the Marie Skłodowska-Curie ITN WDAqua. Her research interests include Linked Data, Mulitlinguality, Wikidata, Underserved Languages on the Web and most recently Machine Learning. Therefore, the paper on Multilingual Data in Wikidata summarizes her current interests well. 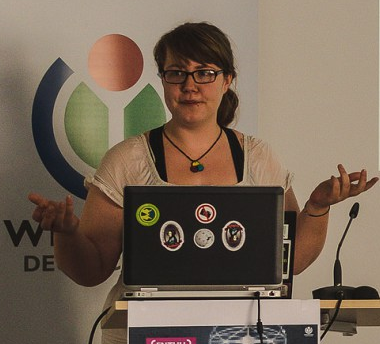 Before getting involved with research, she worked as a software developer at Wikimedia Deutschland in the Wikidata team. There, she was already involved in the previously mentioned topics, developing the ArticlePlaceholder extension, which displays Wikidata’s structured knowledge on Wikipedias of small languages. She is still involved in Open Source projects, mainly Wikimedia related, where she is currently part of the Code of Conduct Committee for technical spaces. © 2019 Lucie-Aimée Kaffee. Powered by Jekyll & AcademicPages, a fork of Minimal Mistakes.